Windows 7 is moving toward the cloud – sort of. 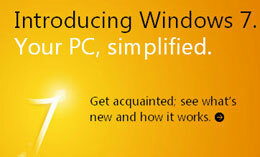 In the latest release of Windows 7, you now have to the ability to easily join a network of other Windows 7 PC’s. So let me first define what a network is. A network would be something that you establish within your home on your wireless internet connection. So your wireless internet at your house is the network upon which multiple Windows 7 PC’s can join. However, you do need to create a network for others running Windows 7 to see.